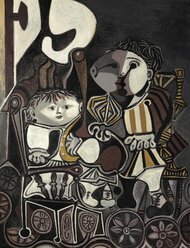 The painting depicts Pablo Picasso’s two youngest children. What strikes me is the depiction of the baby, Claude. In the midst of all kinds of sophisticated design elements, in a sort of cubist composition, the baby’s face stands out as almost a traditional portrait. Could it be that the great man just melted when looking at the little child’s face? This portrait seems a pure depiction of childhood innocence. Maybe the artist was looking back at his own lost innocence, when he first discovered his own talent and had no idea where it would lead him. In 1950, Picasso had just lived through the horrors of the Second World War, which he spent in occupied Paris. The Nazis did not allow him to exhibit, considering him degenerate. The end of the war was a new beginning of artistic freedom. A baby is always a new beginning, too. This entry was posted in Art, Paris and tagged " Ferrari, "Claude and Paloma", "Ferris Bueller's Day Off, Carol Vogel, Christie art auction, Pablo Picasso, Postwar Paris on November 9, 2013 by Claudia Suzan Carley.